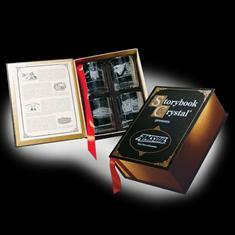 Storybook Crystal is one of the most effective ways to create a lasting impression. Share your company history with this gift of 4 Double Old Fashioned 24% Lead Crystal Glasses. Personalize your publication by selecting two of your most important images such as Logo, Portrait of people, architecture, motor vehicles, products or mascots. Then write a paragraph or two about each image providing historical perspective to add impact to your message. Each Storybook Crystal set features a custom die cut lined insert and a color coordinated bookmark ribbon. Three cover colors to choose from. Write your history for a gift that will become an heirloom.